The Greater Manchester Waste Disposal Authority (GMWDA) is England’s largest Waste Disposal Authority, responsible for the management and disposal of municipal waste from Greater Manchester. It deals with 1.1 million tonnes of waste produced each year, from approximately 1 million households and population of over 2.27 million in the metropolitan districts of Bolton, Bury, Manchester, Oldham, Rochdale, Salford, Stockport, Tameside and Trafford — though part of Greater Manchester, the Metropolitan Borough of Wigan administers its own waste disposal operations, however they are represented on the authority for administration purposes. The waste comes primarily from household waste collections and 20 Household Waste Recycling Centres (HWRCs) provided and serviced by the GMWDA. It handles around 4% of the nation's municipal waste. "Our Aim is Zero Waste"
The GMWDA was created under the Local Government Act 1985 to carry out the waste management functions and duties of the Greater Manchester County Council after its abolition in 1986. The Authority Membership is composed of councillors from across Greater Manchester. 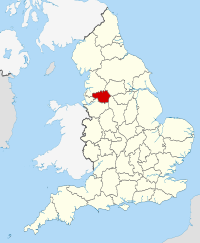 Its headquarters are in Oldham. The GMWDA also operates the Recycle for Greater Manchester organisation, its initiatives and website. Following the creation of the Greater Manchester Combined Authority in 2011, GMWDA has been an integral part of a pilot local government strategy to demonstrate competence in tackling climate change, energy, water, green infrastructure, transport, waste and other issues affecting the Greater Manchester Statutory City Region. The Greater Manchester Waste Disposal Authority was formed in 1986. The Authority is going to deliver at least 50% recycling and 75% diversion from landfill through its existing contractual guarantee with Viridor Laing (Greater Manchester) Limited. In April 2009, the GMWDA signed a 25-year private finance initiative (PFI) waste and recycling contract with Viridor Laing (Greater Manchester) Limited, a partnership between Viridor and John Laing. Since then, a network of 42 recycling and waste management facilities across 24 sites have been constructed. The construction cost was £640 million over five years. Four public education centres (two existing and two new) provide educational resources for school, community and other interested groups. Residual waste that cannot be recycled, instead of being sent to landfill, will be processed into Solid Recovered Fuel (SRF), through the MBT process, for use by chemical producer Ineos Chlor for energy production at its plant at Runcorn. The 275,000 tonnes of fuel fed to the Combined Heat and Power (CHP) plant will produce electricity and steam, replacing energy generated from non-renewable sources.